A. 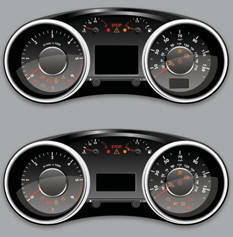 With the ignition on, the needle should indicate the level of fuel remaining. B. With the engine running, its associated low level warning lamp should go off. 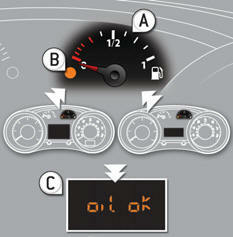 C. With the ignition on, the oil level indicator should display "OIL OK" for a few seconds. If the levels are not correct, top up the levels which are low. 1. With the ignition on, the orange and red warning lamps come on. 2. With the engine running, these warning lamps should go off. If warning lamps remain on, refer to the page concerned. Lighting of the indicator lamp indicates the status of the corresponding function. A. Visual and audible parking sensors. B. ESC/DSC OFF (without Grip control). D. Deactivating the Stop & Start system.